During states of prolonged exposure to high levels of blood glucose, the body responds by producing larger quantities of insulin. It’s believed that the receptor becomes “desensitized” to insulin after long enough exposure to hyperinsulinemia, but is that the whole story? 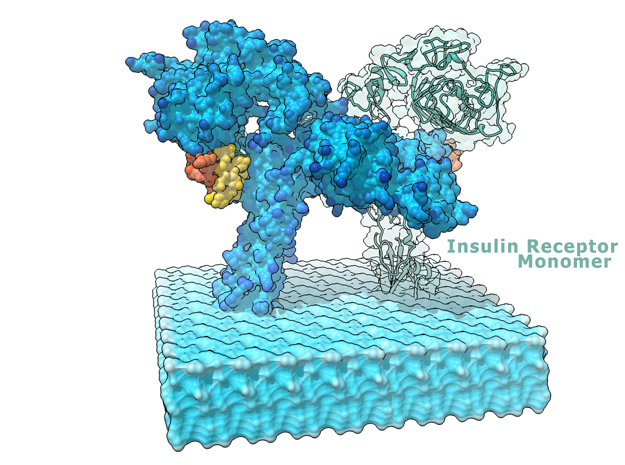 Insulin is a chemical messenger produced by the pancreas in response to food. These types of proteins are called hormones, traveling throughout the body to communicate messages from one cell to another. Insulin notifies the cell to send up glucose transporters because sugar molecules are circulating through the bloodstream. When bound to an insulin receptor, this message sequesters internal stores of glucose transporters up into the plasma membrane. Once in the membrane, glucose transporters begin pumping glucose into the cell gradually lowering glucose in the blood to normal levels. An important protein for sure, you can imagine the dangers of diseases like diabetes when levels of this hormone dramatically change. 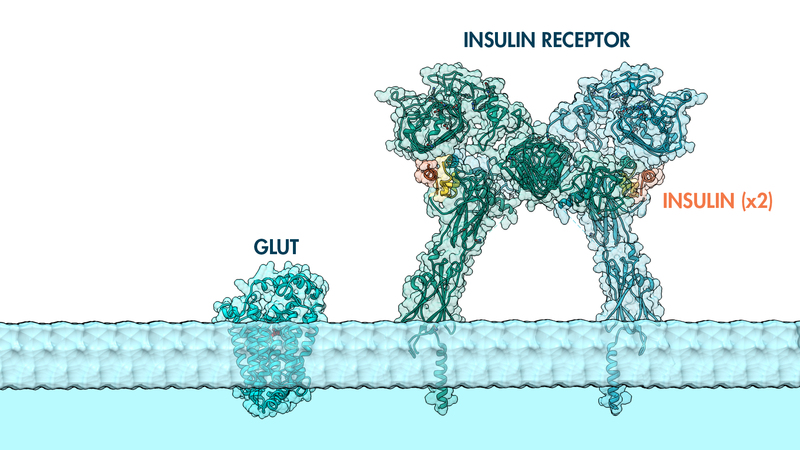 The insulin receptor exists on the plasma membrane as a dimer and is believed to co-localize with other membrane-bound proteins like GLUT transporters. The mysteries surrounding this protein and its association to metabolic diseases is only now becoming fully understood. Join us in examining this beautiful protein. A mysterious protein for sure. Insulin Receptor in Complex with Insulin from Biologic Discovery on Vimeo. 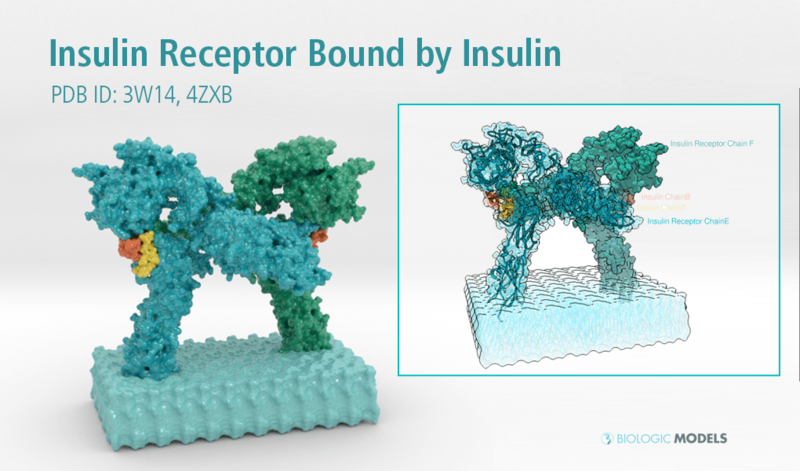 Insulin receptor signaling has a central role in mammalian biology, regulating cellular metabolism, growth, division, differentiation, and survival. Insulin resistance contributes to the pathogenesis of type 2 diabetes mellitus and the onset of Alzheimer’s disease; aberrant signaling occurs in diverse cancers, exacerbated by cross-talk with the homologous type 1 insulin-like growth factor receptor (IGF1R). Despite more than three decades of investigation, the three-dimensional structure of the insulin-insulin receptor complex has proved elusive, confounded by the complexity of producing the receptor protein. Here we present the first view, to our knowledge, of the interaction of insulin with its primary binding site on the insulin receptor, on the basis of four crystal structures of insulin bound to truncated insulin receptor constructs. The direct interaction of insulin with the first leucine-rich-repeat domain (L1) of the insulin receptor is seen to be sparse, the hormone instead engaging the insulin receptor carboxy-terminal ?-chain (?CT) segment, which is itself remodeled on the face of L1 upon insulin binding. Contact between insulin and L1 is restricted to insulin B-chain residues. The ?CT segment displaces the B-chain C-terminal ?-strand away from the hormone core, revealing the mechanism of a long-proposed conformational switch in insulin upon receptor engagement. This mode of hormone-receptor recognition is novel within the broader family of receptor tyrosine kinases. We support these findings by photo-crosslinking data that place the suggested interactions into the context of the holoreceptor and by isothermal titration calorimetry data that dissect the hormone-insulin receptor interface. Together, our findings provide an explanation for a wealth of biochemical data from the insulin receptor and IGF1R systems relevant to the design of therapeutic insulin analogs. 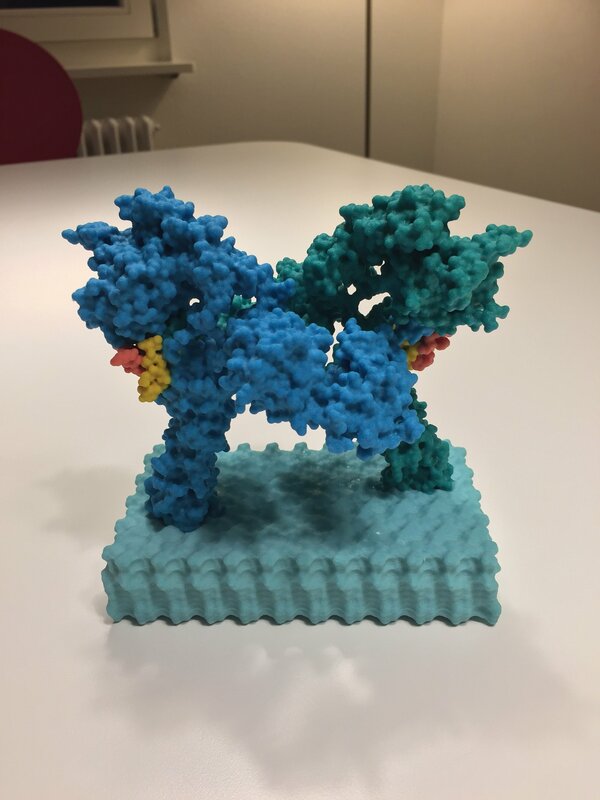 This is a 3D print of the Insulin Receptor in complex with Insulin. This model is generated from PDB IDs: 3Wi4 and 2MFR. 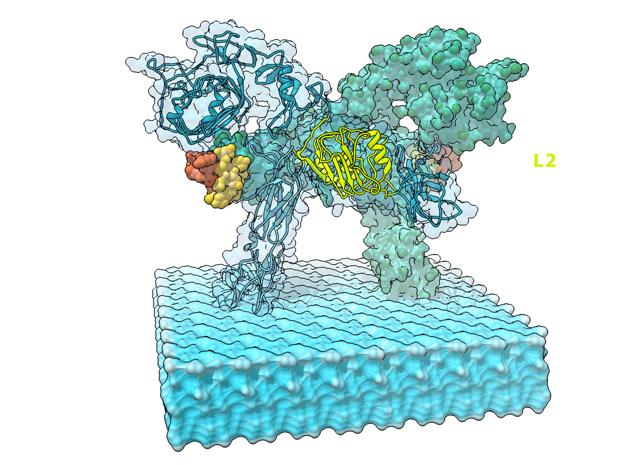 It is color-coded to denote the dimer configuration on the plasma membrane. The Insulin Receptor printed in full-color sandstone. Receptor dimer chains colored blue and green. Insulin chains A and B colored Orange and Yellow. Model is 3D printed in Full-color sandstone and available in Matte or Glossy UV protectant finish and available in multiple sizes.